Getting small local businesses to go online has been the holy grail of the Internet. I’ve written before about some of the reasons local business don’t go online and suggested several ways that they could use emerging technologies to get online with minimal effort. That finally seems to be happening. 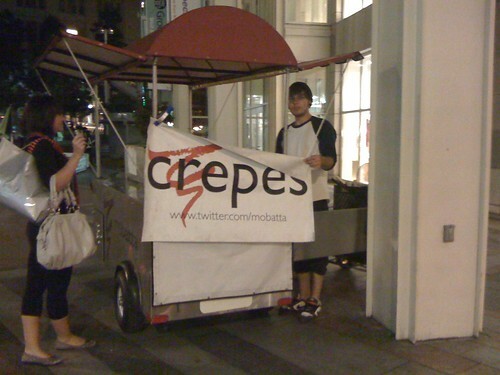 Whether it’s a crepe cart in Seattle, ice cream store in San Francisco or a restaurant in Sedona, businesses are using the simplicity of Twitter for their virtual presence. Most local businesses are too busy running their business to exert a lot of effort maintaining an online presence. If it’s not easy, it won’t get done. My favorite example of a small business reusing their existing work is the Webcam pointed at the wall of Beachwood BBQ where they list the pints on tap. The challenge is that these businesses are only announcing their presence to existing customers or passersby. While this can help drive repeat visits through specials, notices of new arrivals, etc. it does little to bring in new customers. That’s where foursquare comes in. This location-based social game allows users to “check in” to places they visit. Check in often enough and you become the “mayor” of that place. Savvy businesses have latched on to this and begun offering discounts to their mayors. It has also been incorporated into the foursquare check in process. 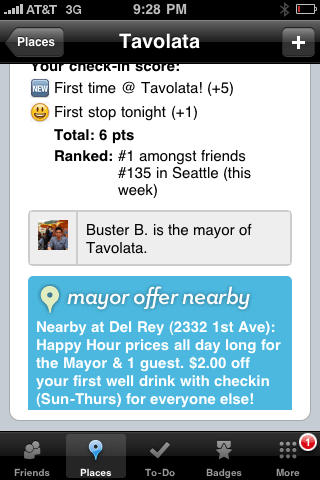 When I checked in at a restaurant in Seattle, I was presented with an offer at a nearby bar: happy hour all day for the mayor or $1 off well drinks for anyone else who checked in. (Checking in updates your social network status, providing further exposure for the business.) It’s one of the first examples of location-based mobile advertising that works. The process is a bit cumbersome now, but it provides a glimpse into where the technology is headed. In addition to providing exposure to businesses, it solves a user problem that local search has long failed at: discovery. People often don’t know what they’re looking for when they’re out. Suggestions, even if they’re sponsored, help fill the discovery gap. This entry was posted in foursquare, lbs, social networking, twitter. Bookmark the permalink.